DPI Facts & Figures | Delmarva Poultry Industry, Inc.
Look at what the chicken industry is doing for Delmarva. In 2018, the Delmarva chicken industry kept production consistent at 605 million birds a year and generated $3.4 billion in value, a 1 percent gain over last year. Thanks to improvements in bird health and processing efficiency, the total weight of chickens processed annually rose by 1 percent. The pace of new Delmarva chicken house construction slowed in 2018, with the number of chicken houses in operation rising just 1 percent. In the past 10 years, the number of Delmarva chicken houses in operation grew by just 3 percent. Contract payments to chicken growers rose 5 percent in 2018, and the wages of chicken company employees were up 4 percent compared to last year. Table can be swiped/scrolled horizontally [ ] on devices with smaller viewing areas. Chicken growers and companies planted 7,521 trees and grasses in 2018 as part of Delmarva Poultry Industry, Inc.'s vegetative environmental buffers program. Chicken companies purchased 93 million bushels of corn, 41 million bushels of soybeans, and 266,800 bushels of wheat for chicken feed in 2018. Chicken companies purchased $260 million in packaging and processing supplies in 2018. Delmarva's chicken companies invested $137 million in capital improvements in 2018, including investments in wastewater treatment and processing plants. We heard community concerns about air quality and acted, investing in new air monitoring stations. DPI, The Keith Campbell Foundation for the Environment, and the state of Maryland are partnering on a first-of-its-kind project to monitor ambient air quality, including levels of ammonia and particulate matter. DPI and the Campbell Foundation have jointly committed more than $500,000 to this effort. "We in the chicken community have a shared interest with all Marylanders in better understanding what air quality is truly like on the Eastern Shore," said Holly Porter, DPI's executive director. "Because we will never neglect our commitment to environmental responsibility, we believe gathering more data about air quality here helps everyone." Our members saved money with a new electric buying group. By negotiating on behalf of farmers and small businesses, DPI secured a low electricity supply rate for members of its electric buying group. The new rate will save each buying group member an average of more than $1,000 a year. We added new leadership and a member relations manager. In December, longtime executive director Bill Satterfield retired from DPI. Assuming the executive director position is Holly Porter, who joined DPI in 2017 as assistant executive director. Porter previously worked on policy for the Delaware Department of Agriculture and held a marketing position at MidAtlantic Farm Credit. Also in 2018, we hired Maureen Duffy as our first member relations manager. Duffy has extensive experience in marketing and sales, having worked in the corporate and non-profit sectors. The fact sheets and visuals below provide important economic data about Delmarva's chicken industry. How does the chicken industry help protect the environment? Delmarva chicken farmers realize regulations are necessary to protect people, animals and the environment. We work with local and state government officials to ensure the health and well-being of the animals, environment and our neighbors. We work with local governments to make our farms better neighbors. In recent years, we've adopted voluntary guidelines to encourage more space between new chicken houses and neighboring properties and residents, while working with farmers to plant trees and grasses as living buffers next to their chicken houses. We've worked with county officials as they adopted laws to accomplish these goals. 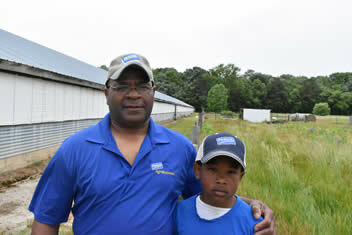 Chicken farmers are part of Delmarva's communities and work hard to remain a welcomed segment of the landscape. Delmarva's farm families are some of most regulated farms in the country. This regulation is accepted by Delmarva's chicken farmers and we have made significant advancements with measurable improvements in farming practices to protect water supplies. Worker installing a Vegetative Environmental Buffer. What about added hormones or steroids? No artificial or added hormones are used in raising chickens anywhere in the United States. In fact, it's been illegal to do so since the 1950s. We realize this can be confusing when you see "hormone-free" on a chicken product label at the grocery store. But, that label must also include a statement that hormones are not used in the production of any poultry. 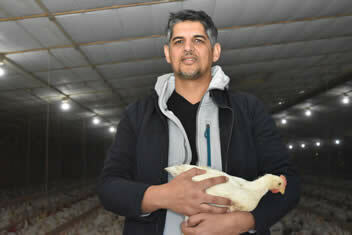 We keep our chickens healthy with proper nutrition, good veterinary care and quality living conditions. Today, antibiotics are used in chickens and other farm animals for the same reason they are used in people - to treat or prevent disease that causes pain and suffering. When birds are sick with a bacterial infection, we treat them with antibiotics because it is the ethical thing to do. Government regulations exist to prevent antibiotic residue in meat. The U.S. has the safest food supply in the world. Chicken farmers must adhere to specific antibiotic withdrawal times that have been established to ensure that meat entering the food supply is antibiotic free and safe. 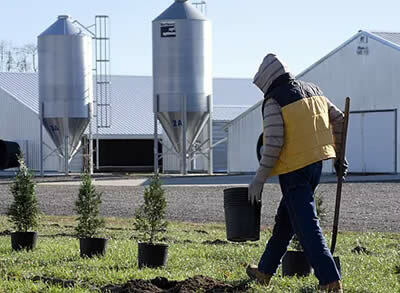 Providing safe, wholesome chicken for consumers begins with providing the birds with a clean, safe growing environment. When birds get sick or are threatened by disease, the ethical use of antibiotics is good for the animals, but also good for people. The healthier the animal, the less likely bacteria enters the food supply. Farmers, companies and others in the Delmarva chicken industry support consumer and production method choice. Our family farms use a variety of production methods - including, for some, no-antibiotics-ever production -- to provide consumers with a choice in the decisions they make for themselves and their families. Finding ways to raise chickens without any antibiotics is the latest example of an industry committed to innovation, producing a wide range of chicken products for a wide range of consumers. Where does all the chicken manure go? Chicken manure provides area farmers with a locally-produced, organic, slow-release plant food that enhances soil health, quality and ability to retain moisture. This provides area farmers with chemical fertilizer alternatives and conserves natural resources. Chicken farms do not simply dump chicken manure, or chicken litter - manure and wood shavings that make up the bedding in a chicken house - into waterways, or haphazardly apply manure to farm fields. Each Delmarva chicken farm is required to provide the state a natural resources protection plan. These plans are unique to each farm to ensure manure is handled in a way that keeps it away from the water supplies that are so important to our communities. In fact, in the Chesapeake Bay watershed, agriculture's commitment to responsibility has led to demonstrable reductions in the amount of nitrogen, a common nutrient, in the Bay. The Chesapeake Bay Foundation and other Bay monitors have recognized and applauded this progress. Regardless of the size or type of a farm, carefully formulated feed, access to a plentiful supply of clean water and food, adequate room to grow, professional veterinary attention and proper handling are all important factors in raising chickens. 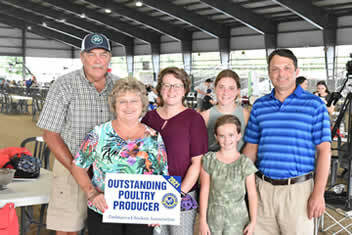 Delmarva's poultry farmers are committed to providing excellent care for their birds.